A brand-new series by the author of the best-selling Crimson Worlds saga. Pursued by their deadly enemy, Compton and his fleet must flee into the darkness of unexplored space, seeking safety...and ultimately a new home. Their journey will take them deep into the heart of the First Imperium, to the silent, windswept worlds where the ancient race that built the Regent once dwelled...and uncover the lost secrets of its disappearance 500,000 years ago. ©2015 Jay Allan Books Inc. (P)2015 Audible, Inc. Narration is perfect. Jay Snyder is always good. The story is interesting. For me the irritating problem is that the author loves repetition as though he doesn't have faith that the reader GOT it the first time around. Sometimes that repetition would go on and on until I felt like fast forwarding so I could hear more of the story and less repetition of what had already been said. If someone reduced the repetition, the book would be shorter but more enjoyable. 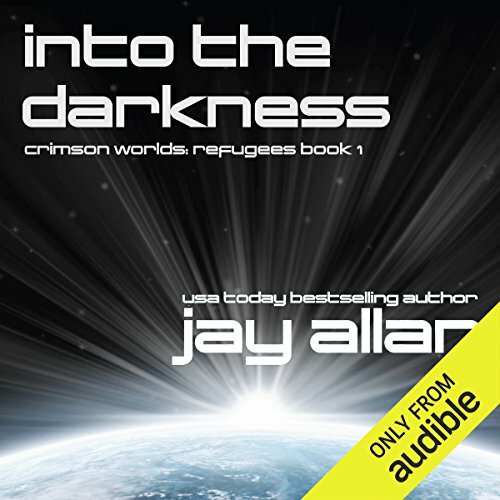 Jay Allen's Into the Darkness is the 1st installment of the Crimson Worlds Refugees series. Earth has been saved by the destruction of the only known warp gate into the earth's solar system which has come under attack by a machine intelligence that appears to be the only remaining remnant of an extinct race. To manage the maneuver, Admiral Compton and 300 of his ships take on the suicide mission of holding the line on the other side of the gate and become trapped in Imperium space with no way home. The tale describes their journey deeper into the dead realm as they encounter alien artifacts, unstoppable robot war machines, and internal dissension and mutiny. The sci-fi elements focus largely on physics with interstellar travel and high tech weaponry and assorted gadgets. At the same time, cyber aspects of artificial intelligence play heavily into the alien threat. The real focus however is the varying responses of the various characters when their fate has been sealed. Expectations for a bigger backstory on the alien origins and how they became extinct should play prominently in future installments. The narration is quite well done with a solid rendition of genders and the extreme multicultural nature of the crews. Very well done book. Timely topic with all the concerns about run away artificial intelligence at the present time. Well put together storyline with believable well developed characters. Some science snobs might bristle at the stretches of physics/science but I thought it made a wonderful story. Hey it's science FICTION not science fact. Very professional job by Mr. Snyder good voice control and good choices for voices of the many characters. Overall very much worth the time and money. If you like lots of detailed space battles, this is the book for you. If you are a computer scientist, the hand waving will drive you nuts. The premise gives an interesting social structure that is explored, but I do feel like the plot twist for the whole series was hinted at too heavily, and is obvious without being revealed yet. If he uses the word "indeed" one more @#$* time.. I'm over half through and it's starting to drive me nuts. Jay Allan writes like a somewhat medium intelligent person trying way too hard to sound over intelligent to his dumb friends. The storyline is good, the performance is amazing, but oh-my the dialog can be mind numbing at times. Went is not expecting much, blown away! I went in not expecting much and was completely sucked in before the end of the prolong! The performer, I can't really call him a narrator, gets into it and makes each character recognizable, just by his nice accent work. I'll be getting the whole series. This story is a little reminiscent of Battlestar Galactica with a "rag tag" group of ships that are in deep space, hounded by robots moving towards a potentially human or human like target. :The characters were well done, but the story in some places was overdone, in that there was a lot of time and verbiage that did not advance the plot. Overall, it was a good read and I will continue to the next book in the series. By the way, the narration was fantastic. story is intriguing from beginning the concept and it just is full of action right off the gun. I can't wait for the next one. I liked the book, it entertained me, which is what I ask for above all else. It takes place in space on spaceships. No planet of the week, time travel, romance, or scientific jargon. No detailed taking apart and putting back together of weapons. The story was predictable, matter of fact I kept thinking I had heard it before, but I had not. It was a lot like a 1950's war movie, with the cheese so thick you could cut it with a knife, but sometimes that is what I want. I don't want a steady diet of it, but it was a nice upbeat patriotic read. I must agree with another reviewer that Admiral Compton, the main character was a bit ego maniacal. Yet, he was an admiral and he was trying to save Earth. Democracy rarely works in these types of situations. While Admiral Compton was similar to a Captain Picard, it was a shame that the bad guys had to be Chinese and Russian. Roddenberry would have found better bad guys. 15 sur 23 personne(s) ont trouvé cet avis utile. I only made it to chapter 7 hoping someone would kill Compton and prove the human race was worth saving. Apparently being ego maniacal, racist and backstabbing are the true strengths of a hero in Jay Allan's world. Maybe it got better but this was several hours of my life I will never get back. 19 sur 31 personne(s) ont trouvé cet avis utile.